This week the global climate talks known as COP 23 kick off in Bonn. Two days ago, Syria -- SYRIA, PEOPLE -- announced that it would sign on to the international climate agreement known as the Paris Accords, leaving the U.S. the only holdout. Actually, make that attempted holdout. While U.S. President Donald Trump made a big announcement about his intention to leave the agreement, there's no actual way to formally leave until 2020. The talks are hosted by Fiji. This is the first time an island nation on the front lines of the climate change battle has hosted. Given the logistical challenges and costs of hosting the 23,000 expected attendees, Bonn is the physical host. 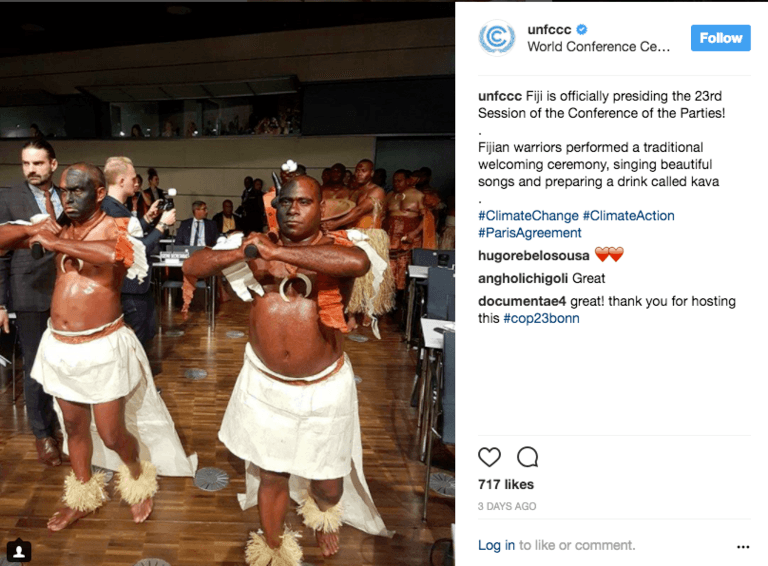 But Fiji has made its presence known in other ways, with a traditional welcoming dance (see above), a decree that the talks embody the spirit of “Talanoa” - a Fijian concept of open discussion, and even a VR booth to showcase the impacts of climate change on the islands. The plan for this year's climate talks is to focus on implementation -- how to measure carbon and how countries will report on their progress meeting their Intended Nationally Determined Contributions INDCs. While the U.S. is still in, at least until 2020, the Trump administration can impede progress in subtle ways, for example by sending a smaller, less powerful, delegation and hosting events that promote coal, natural gas and nuclear energy. Despite these drawbacks, the larger global effort to address climate change continues full steam ahead. WRI research confirms that almost 50 countries have already reached "peak carbon." 1200+ companies, states, cities and universities have told the world "We are still in." And companies continue to set and reach assertive climate goals. In fact, the uncertainty around the U.S. participation left a leadership vacuum which is quickly being filled. California Governor Jerry Brown is on the ground in Bonn to discuss linking the California and EU carbon markets, and former NYC Mayor Michael Bloomberg pledged a $15 million dollar donation from his foundation to bridge the funding gap that may occur due to the U.S. withdrawal. Let's call this one a glass half full of melted icebergs.